I haven’t been reading very many comic books lately. In fact, I almost never buy single issues of any comic title. I only get trades of titles I’m interested in. And that list is pretty short these days. In fact, I think it’s pretty much just The Walking Dead on the list right now. Like I said, short. The reasons for this are several, but the most important of them is the time involved in reading and keeping up with monthly titles and the storage of same. I already have quite a few long boxes of comics in the house (more than quite a few) and am not really looking forward to adding an additional room to accommodate more. And yes, I know the majority of the titles are available in digital form which would allow me to read them on the iPad or some other tablet. That wouldn’t take up much space at all. But for whatever reason, call me a purist, I prefer my comics in floppy form. I also like reading a newspaper too. Of course, as is often the case, an exception comes along. Said exception du jour is the new Star Wars comic from Marvel. It started in January with two issues out so far. They are scheduled to come out monthly, at least until the new movie (Star Wars: The Force Awakens if your keeping score at home) is released in December. But I would imagine, if it continues to be such a big success, the comic could go on indefinitely. That would be fine with me. My one word review of the first two issues is this: awesome. I’m really enjoying it so far and I have no reason to think I won’t continue to do so. The writing by Jason Aaron and art by John Cassaday are both outstanding with Aaron really nailing the mannerisms and speech of the major (and minor) characters. 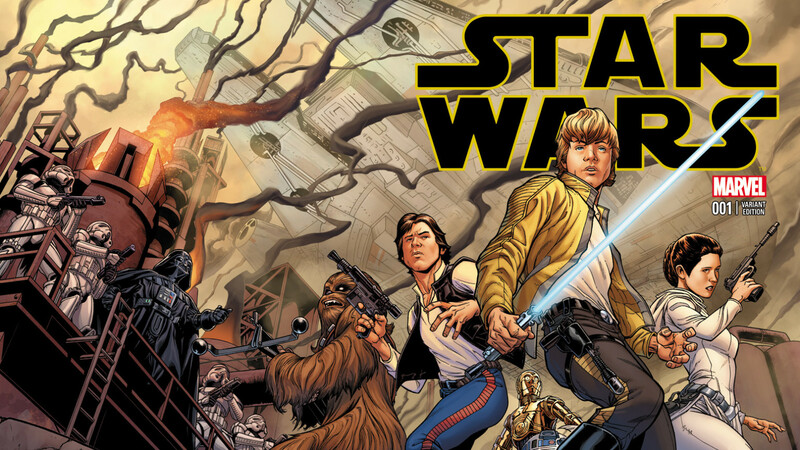 I won’t get into the story or anything but if you’re not currently reading the Star Wars comic, I highly suggest you do so — especially if you’re a Star Wars fan. I like it so much it was even my pick on a recent episode of The Flickcast. A ringing endorsement to be sure. I’ve lived a fair amount of time on this planet and have probably become a bit jaded over the years. It’s refreshing when something like a comic book comes along and reminds me me how fun things can be. It’s helped change my attitude for the better, to be sure. Of course, I can’t forget another reason for my improved attitude: there’s a new Star Wars movie coming out this year. This. Year. I was pretty sure that was never going to happen. I’m very happy to be wrong. Yeah, life is pretty good. This entry was posted in Comics, Movies, Star Wars and tagged Carrie Fisher, Comics, Harrison Ford, J.J. Abrams, Mark Hamill, Marvel, Movies, Star Wars, Star Wars: The Force Awakens. Bookmark the permalink.